With the Panthers hosting the Bengals yesterday, both teams wore “One Carolina” helmet decals to support the Hurricane Florence relief efforts and show solidarity with the victims. (ECU wore this same decal on Saturday night, and lots of other schools across the Carolinas wore it as well.) It’s not clear, at least to me, whether this was a one-game thing for the Panthers or if they’ll keep wearing the decal for additional weeks. As you can see, the Titans’ uniforms were sort of an inverse of the Jags’ (I say “sort of” because the Titans’ light blue and Jags’ teal aren’t a true match), which some observers found particularly off-putting. • After upgrading to the Riddell SpeedFlex helmet for the preseason and the first two games of the regular season, Pats quarterback Tom Brady went back to his old-school helmet for last night’s game against the Lions. I did a little photo research and found that Crabtree wore gloves in Week Two but was bare-handed in Week One. As for Reed, he wore gloves in Week Two and Week One. Interesting to see that both of these guys went glove-free yesterday. So that makes at least three QBs with new teams this season — Cleveland’s Tyrod Taylor, Arizona’s Sam Bradford, and now Smith — who properly had one gold star in Week One but then “graduated” to additional stars in Weeks Two and Three. It would be easy to think that the NFL issued a new patch protocol after Week One, except that Minnesota’s Kirk Cousins, in his first year with the Vikings, still has only one gold star, which is as it should be. In short: There’s no rhyme or reason here. I’m also unsure whether these inconsistencies extend to other captains beyond quarterbacks. (QBs are much easier to track because they’re photographed so frequently at close range, which makes it easy to see small details like captaincy stars.) Has anyone noticed anything similar going on with non-QB captains who’ve joined new teams this season? The obvious solution, of course, would be to just scrap the stars, which are a silly gimmick. (You could arguably say the same thing about the patches themselves.) Anyway, I’ll ask the NFL about the inconsistencies and see if they can clarify the situation. • In addition to the aforementioned Texans and Jaguars, three teams wore white at home: the Dolphins, Rams, and Panthers (who, as you can see, also wore black socks once again). Membership update: Some new designs have been added to the membership card gallery (including Ben Froehle’s, shown at right, which is based on Utah State football). Really nice job on that gradation by card designer Scott Turner. Baseball News: Muscular Reds P Michael Lorenzen appear to have busted out of his sleeve piping (from Jered Petrey). … Nationals OF Bryce Harper was wearing a jersey that he signed yesterday. It was given away after yesterday’s game, though it’s not clear if any of the other players participating in the giveaway also wore their signed jerseys (from @thefrownyface). … One of the suites at the Braves’ stadium has a picture of Casey Stengel in the 1939 Boston Bees road uniform. “Dig the colored belt loops and the font I tend to associate with the Pirates,” says Austin Gillis. Football News: Nebraska is one of the teams to have added players’ area codes to their nose bumpers. They weren’t there when Nebraska’s uniforms were updated this summer (from James Hendrickson). … A few Utah Jazz players appeared at Utah State’s game against Air Force, and guard Donovan Mitchell, who has an endorsement deal with Adidas, covered the Nike logo on the jersey he was given with green tape (from @trayallday). … Virginia RB Jordan Ellis had some kind of X on his front bumper instead of the ACC logo. 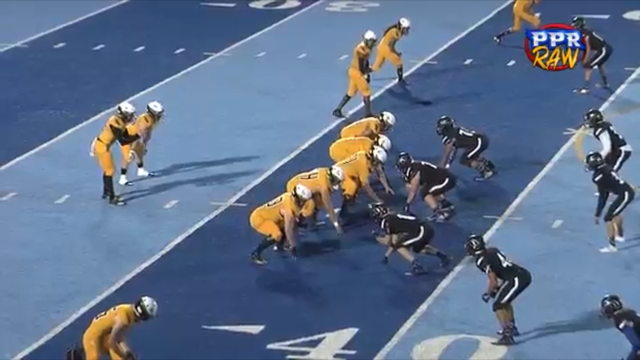 … Two San Diego-area high schools, West Hills (black) and El Capitan (yellow), played a color-vs.-color game on West Hills’s blue field (from Brad Gomez). Hockey News: The jerseys for yesterday’s Sharks alumni game featured the team’s foundation logo below the crest (from @OlegKvasha). 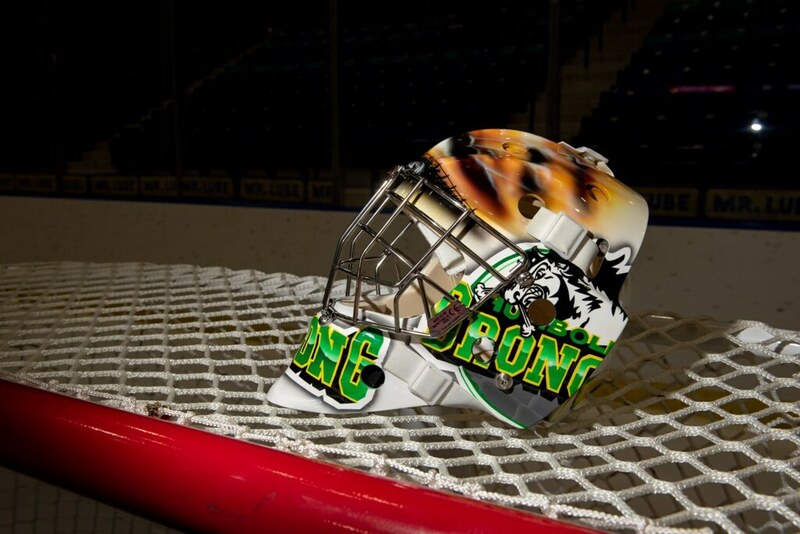 … From the Western Hockey League’s opening weekend (for more, see yesterday’s Ticker): The Saskatoon Blades wore previously revealed Humboldt Broncos tribute uniforms, and goalie Nolan Maier wore a matching mask, while the Swift Current Broncos added an interlocking SC to their pants (from Wade Heidt). Basketball News: Cross-listed from the football section: Jazz players Donovan Mitchell, Royce O’Neale, and Georges Niang appeared at Utah State’s football game against Air Force. Mitchell, who has an endorsement deal with Adidas, covered the Nike logo on the jersey he was given with green tape, while the other players didn’t (from @trayallday). Soccer News: Saturday’s NWSL championship game featured a patch of the game’s logo in the lower corner of the front of the shirt, because the places where patches would go in other sports are taken in soccer. … In Scotland, Celtic goalie Craig Gordon wore what looked to be black training shorts and socks (and tights), clearly different from the black shorts on the rest of the team. … Scottish team Rangers have worn three different variations of their second kit in the Europa League this season, with the third appearing last Thursday. Additionally, winger Ryan Kent had the colors on his sash reversed (blue is supposed to be on top) for half the game Thursday (from @bryant_rf). … There were blue-vs.-blue matchups between Cardiff City and Manchester City in the Premier League and Philadelphia and Sporting KC in MLS. … English club Lewes claims to be the only club in the world to pay its seventh-tier men’s and second-tier women’s teams equally, and has used its shirts both last season and at the beginning of this season to promote gender equality. 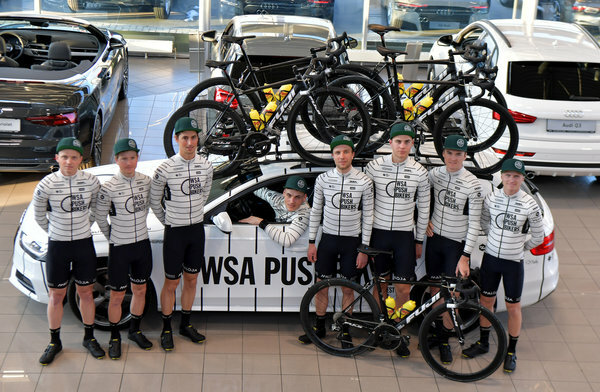 Grab Bag: Austrian cycling team WSA Pushbikers showed up at the road world championships in Innsbruck with a team car in the form of a gloriously unpainted — naturally, team cars are usually in team colors — vintage Mercedes. Apparently, that Slate writer who bitched about the uni combos that the Titans and Jaguars used doesn’t know the difference among light blue, teal and aquamarine (the last of those isn’t in either club’s color scheme and never has been). The writer of the slate article also said that all teams have three complete sets of uniforms, with three sets of pants. I don’t believe that is correct. For instance, don’t both the Packers and Steelers wear yellow/ athletic gold pants for home and away? Add in their Color Rash pants, and that would be only two sets of pants. The Bears also only have two sets of pants, navy and white. They have used their normal navy jerseys with their normal navy pants for their Color Rash games. Yes, that point in the article is incorrect. That Slate article seemed like it was written by a 5-year-old. FWIW, lots of other people online seemed to dislike the look of that game. I’m not saying they were right; just saying that the Slate writer wasn’t the only one with that opinion. I thought the game looked awful, and I’m a little surprised more fellow Uni Watchers don’t share the sentiment. The article was definitely bad, but I do agree with the basic point that the uniform matchup was not a very good one. The Jags should’ve brought their black pants for this one. I was watching RedZone yesterday, and for a time they had the Jac-Ten game as part of a split screen with another game. Can confirm it looked enough of a mess, and even the RZ announcer had to pause a couple times, to be sure he was identifying the correct team. How does Brady’s helmet switcheroo fit the one-shell rule? I believe there is a provision that allows a player to “upgrade” to a model deemed safer than what they currently wear, but for a guy to “downgrade” back to his previous model (particularly one that is on the black list and is only able to be worn by said player under a grandfather clause)? I would have to think that something here is not in accordance with the rule. I believe the one shell rule prevents TEAMS from changing the color of their helmet shells, but doesn’t prevent PLAYERS from changing their helmet models as often as they want. The list of banned helmet models is a separate rule. I don’t know the specifics of how that relates to Tom Brady’s helmet. If you read the memo from 2013 (link below), the stated purpose was that the league wanted each player to use the same helmet shell for the entire season. The memo explicitly states that throwbacks that require a second set of helmets are now banned, but it doesn’t explicitly say that different colored helmets are not allowed, but they are now impractical as a result of the rule. It is not practical for teams to paint the helmets a new color one week, then paint them back the next week, so this may have been an unstated, but intended consequence of the rule. 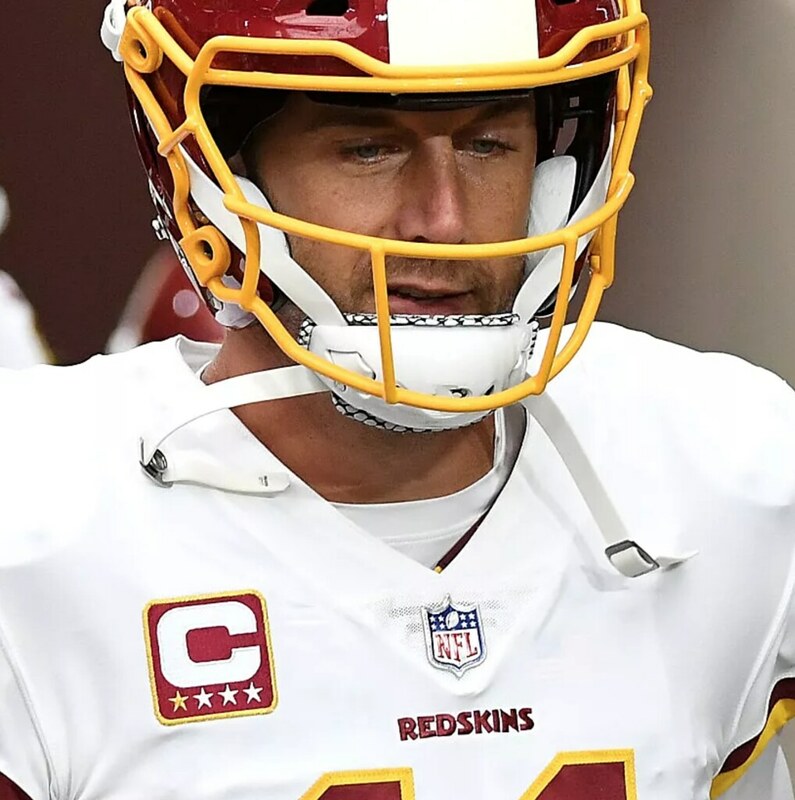 Given the technology available at the time (and possibly still today), the only practical way of having two different colored helmets during the season is to have 2 sets of helmets, and that is what this rule specifically forbids. So it stands to reason that it would forbid individual players from switching out their helmets on a whim throughout the season. Forgot to paste the link I promised! Helmet is still grandfathered. Plus he’s Tom Brady. >> …Plus he’s Tom Brady. I was afraid this had something to do with it! But my point about the switch is that once he decided to go with the new helmet, I’m surprised he is allowed to switch to anything other than a newer, safer model, even if he is grandfathered into wearing the old helmet. But again, I think you hit the nail on the head with who the particular player is (unfortunately) making this switch OK. The rule is to prevent teams from forcing players to switch helmets because of shell color issues. The rule does not prevent players from choosing to switch on their own, because then the player is taking on the responsibility of any risk, not the team. The rule is about team liability. the announcers in the Denver @ Balto game jabbered quite a bit about gloves as roughly the first half of the game was rainy and one of them (probably Jas Lofton) had a strong opinion that gloves were a net negative in rainy conditions. Some receivers who started the game gloved took them off in second quarter. Ah, interesting. So that presumably explains Crabtree. Thanks, Gregg! Yep, the announcers said that wet conditions was the reason for Jordan Reed going gloveless in the Green Bay-Washington game too. Interesting that super-sticky receiver gloves are useless in the rain. Lofton said there were different gloves meant for use in rain but he didn’t think they were very good. Sorry about the links. Brown is picture 25; Brown is 41; Snead is 42; and Moore is 45 (although that picture is from a special teams play). I saw that Washington was wearing white pants with their burgundy jerseys again. I know it was mentioned here in a previous week when they wore them. 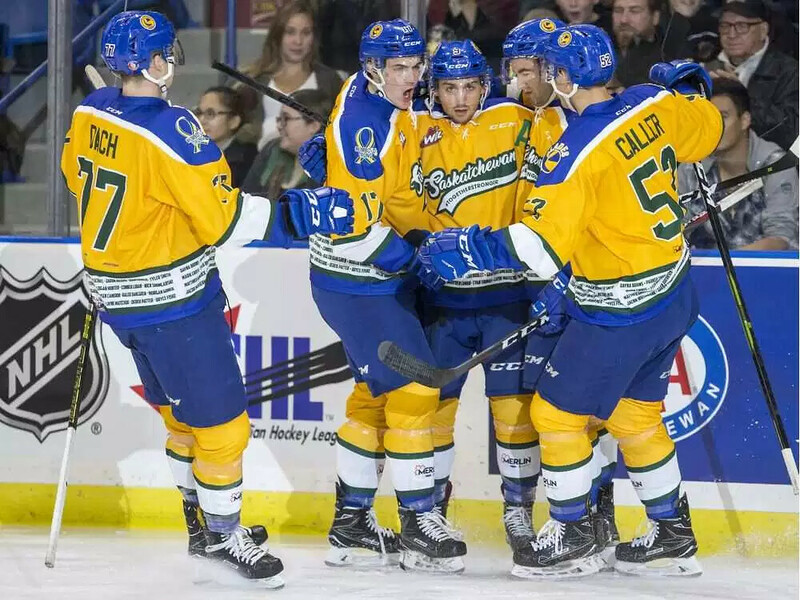 Do we know if that is their new standard uniform, or are they going back to their yellow/ athletic gold pants at some point? I hope that the yellow/athletic gold pants, if they’re still being used, are part of only a rarely seen alternate look. It’s about time the white pants returned! Gold pants are the only logical choice for the ‘Skins. The GUD indicates that the last time (before this season) that Washington wore white pants with the burgundy jerseys was in the 2013 preseason and 2012 regular season. They wore the white pants against the yellow/athletic gold-pants Packers yesterday, but against the white-pants Colts last week. They wore yellow/athletic gold pants for all three burgundy jersey games in the preseason this year. 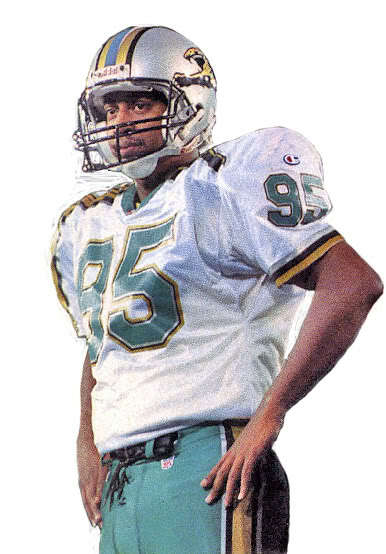 I prefer the Jaguars in the teal pants with the white jerseys. Think it looked good. 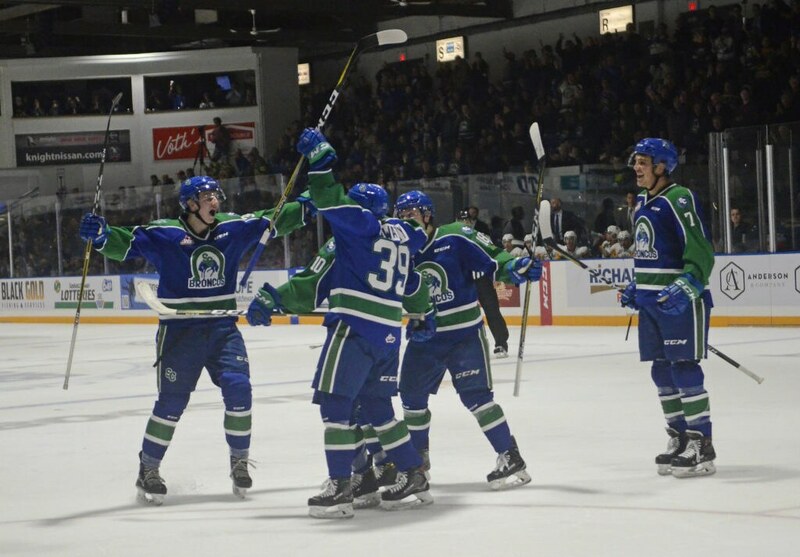 If they wear the white or black pants with the white jerseys, it basically just looks like their colour scheme is black and white. Not enough teal trim and there have already been complaints about no gold trim in the uniforms. The teal pants help fix this problem. Was first time Jags wore teal pants. Though I remember those first prototype uniforms had the teal pants. That was with the first logo before Jaguar Cars took the legal action and the lawsuit was settled. Excellent point on the prototypes, Wade. I’ll add that to the text! On the one hand, I agree that the Jaguars’ uniforms with the white jerseys and black pants are too plain and colorless. But I also agree that the teal pants clashed with the Titans’ light blue jerseys. I’m not sure what the Jaguars’ best option here would be. Ideally, the Titans would have worn their navy jerseys against a teal team like the Jaguars instead of their light blue ones. I think the Titans wore their Titans blue jerseys instead of the navy ones because of the heat. TIAA Bank Stadium doesn’t have a canopy like Hard Rock Stadium has. The”X” on the nose bumper is most likely for Xenith, who makes that lid. Is it possible teams are reusing captain’s patches from previous players? Is it just me, or when the Bills wear all-white, their colors seem to blend with the other team’s colors? For example, to my eye, the blue almost looked purple vs. the Vikings. And, during Pinktober, they almost always look like a blue-and-pink team. Am I crazy? https://goo.gl/images/DVzNjr vs Vikings yesterday. I can’t be the only one who thinks maybe their colors are weak and get washed out or something by other, stronger colors. Well, the Washington Capitals decided to get started early in the day (I consider any uni announcement before noon Eastern “early”): Throwback third jerseys officially announced, to the shock of no one, I’m sure. Unis are basically the same as they wore before the Adidas switch, red throwbacks with “Washington” in white (the original 1974-1995 red unis had that lettering in blue). And the collars don’t look like Adizero garbage, since they’re solid white. Another throwback that’s just as ugly now as it was in the ’80s, although I do appreciate the Caps keeping the white-shoulder-yoke look alive. The Shoulder/yoke doens’t look as proportionately good as it did int he 1980s. Plus, the front lettering should be individually sewn, not one big crest. Looks a bit goofy this way. Worth noting that the Capitals unveiled thirds this morning…just reinstating their retro design from ’17 after the year-long hiatus. I’m continually surprised that they didn’t switch to their retros full-time during the Adidas switch. They’re widely loved here in DC, while it seems like many are pretty take-it-or-leave-it on the standard set. Though, now that they won the cup in them, they’ll probably never leave. I have heard that Ted Leonsis hates changing jerseys, because he sees it as a hardship for fans to keep up with, so maybe that’s part of it. Don’t recall where I read that though or if it’s true. I had concerns that when the Penguins won the Cup in 2009, that they’d end up hanging on to that “Vegas gold” color for a good, long time. By the time they won again in 2016, Vegas gold was on its way out the door. In short, you never can tell. I never had a problem with Vegas gold as a color. The Penguins just never executed it well. If they took their current home jersey and replaced all the current yellow-gold with Vegas gold, I think it would look smashing. Doesn’t sound so equal to me. A seventh-tier team would be made up of what, toddlers and nonagenarians? 4 players in anthem protest is “some”? Given the total number of players in the NFL, I’d say there is a few or a couple, but not some. Where did I use the word “some”? They then go on to list 5 (sorry, miscounted earlier) players who protested. 5 players is less than 1% of the league’s personnel. That’s not “some”. This seems like an awfully small thing to complain about. Really? Accuracy in use of the language is an awfully small thing to complain about? My friend accuracy in language and a lack of understanding of numbers and language is a HUGE problem in this country. If it’s going to be a big deal that all the NFL is going to be painted with a brush of 5 players (0.2% of the league’s players), then it should be accurate. 0.2% is not “some”. It’s “a few” or “a couple”. And I get you’re trying to be sarcastic. I completely agree with the importance of accuracy in the use of language, but what you’re saying isn’t accurate. “Some” denotes any number more than 1, and “a couple” means SPECIFICALLY 2. So “some” is accurate for 4. “A couple” is not. 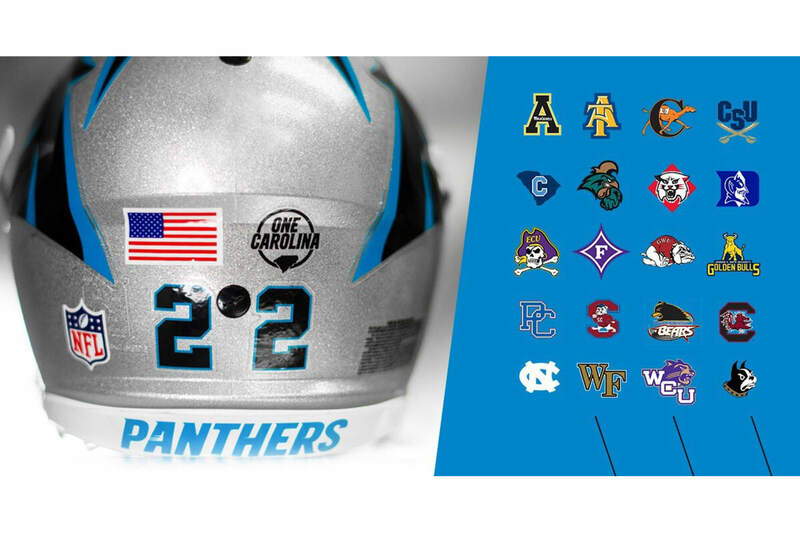 This shows all of the colleges across the Carolinas who wore the “One Carolina” helmet sticker for Hurricane Florence. Thanks, will add that to today’s entry. I was also surprised to see the Giants in white pants on the road. I went back and re-watched the video they released showing their unis for all 16 games this season, and they are wearing white pants for two road games in which they are wearing the blue jersey (at Houston and at Carolina), but gray last week at Dallas. Strange. You know, when I saw the white pants listed for road games in that video, I figured it had to be a mistake! So the only time this season when the Giants are wearing gray pants with the blue jersey this season was the game against the Cowboys, who wear silver(ish) pants. But when playing against teams the Texans in white pants, the Giants also wore white pants. I do wish that teams put more consideration into what their opponent is wearing when deciding what to wear themselves, so as to create more contrast. I realize that it isn’t the end of the world if two football teams are wearing the same color pants, but all else being equal, I think it’s better when they are different. A total of six games this week featured one team in mono white against a team in white pants. I find games with that much white to be visually boring. Add in the Browns’ mono-brown, the Seahawks’ mono-blue and the light blue vs. teal game in Jacksonville, and it seemed like a lot of visually unappealing games this week. The best matchups of the bunch were Saints-Falcons, 49ers-Chiefs, Packers-Redskins, and Bears-Cardinals. For me, games involving the Cardinals and Falcons (unless they are wearing their throwbacks…man, I wish that one-shell rule would go away!) instantly get low marks. Saints in black(yoga)pants, Redskins in burgundy-over-white and Bears in blue bottoms? Thumbs down. Hey, I didn’t say those four games looked GOOD, per se, just that they were the best of the bunch. I agree with your criticism of the Saints, Falcons, and Cardinals. In general, I also prefer Washington in athletic gold pants, but I’m willing to let it slide against another team in athletic gold pants like the Packers. But you have a problem with the Bears in blue pants???!! I love the blue- white- blue look! Much better than a boring mono white ( which I assume is your preference). Not a fan of Carolina’s white jerseys for the same reason I don’t like New England’s. They both have silver helmets but have no silver in the jerseys or pants. I’d prefer silver pants, but even some silver trim would look better. Carolina’s white jerseys and pants may be completely devoid of silver, but the Pats’ white unis at least have some – the collar, the numerals, and the logos all have a bit of silver in them. Actually you are right about the collar and Elvis face having silver, there is no silver on the numerals. 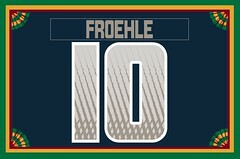 It would be a better look with silver pants, or more silver trim on the white jersey and blue pants. I wonder if teams with silver helmets shy away from wearing silver pants when wearing white jerseys so they don’t resemble the iconic Cowboys look? He pulled off the gradient, excellent! Looks sharp, excited to whip that bad boy out and make everyone jealous! That Flyers mascot …. oof. Just wondering if anyone else watching the Rams/Chargers game confused the Chargers’ yellow gloves with thrown flags when the Chargers made tackles? Second game in a row where Washington wore white pants. Much better look than the gold (yellow) pants. Re: Nebraska’s nose bumpers, Scott Frost started that at UCF and brought it to Nebraska with him.